I’m always in the market for a good hearty soup! This delicious Lentil Sausage Soup is great for a weeknight as lentils cook relatively quickly. I served it up with a green salad and some equally hearty Irish Soda Bread. ~yum~ Like most soups, it freezes well. When making soup, it’s important to cool it quickly in order to refrigerate it. If hot soup goes into the refrigerator, you risk raising the temperature in the fridge, possibly compromising everything in it. If warm soup lingers in the “temperature danger zone” (40 – 140 degrees Fahrenheit) for too long, you risk an unwelcome science experiment. I use a prep sink to make an ice bath for my soup. I fill it with ice and some cold water, as high as the soup is in the pot. If you don’t have a small sink, you can use a giant bowl. I take the pot off the stove and put it directly into the ice bath. 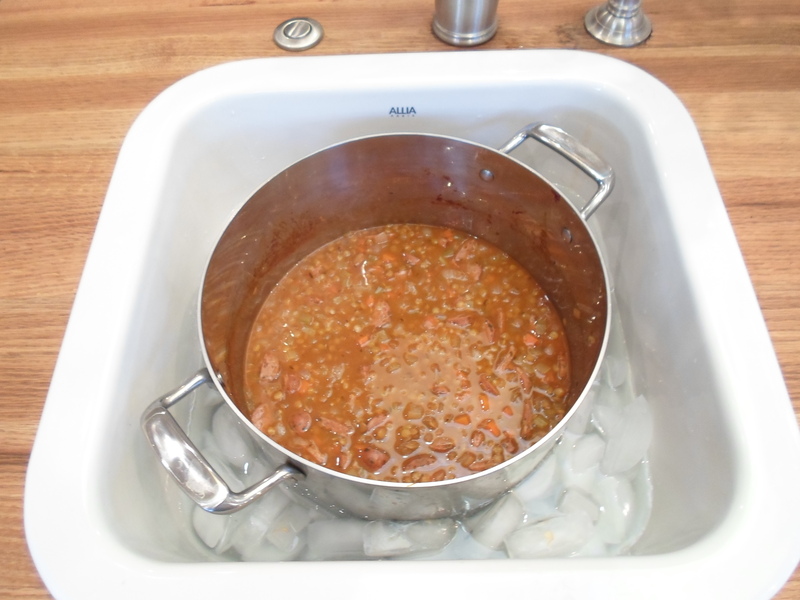 Alternatively, you can cool soup quickly by pouring it into a bowl and then setting it into an ice bath. You can also distribute it into smaller, shallow containers for quick cooling.